Pavements, patios, driveways, car parks and all outdoor areas get filthy and overgrown over time. 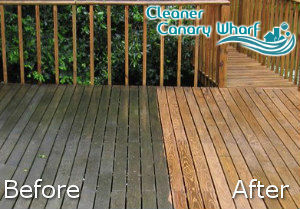 They should be washed with pressure washing machines to get rid of the dirt accumulations, moss, weeds, algae and mould. We can implement effective and thorough jet washing of your property’s external areas, located in Canary Wharf E14, which will have impressive effect. Our cleaners are supplied with modern equipment and qualitative products for sanitising. They can restore the spotless and presentable state of your patio, driveway, pond, swimming pool, external walls, car park and outdoor areas. You can rely on our staff to sanitise your filthy and overgrown paved, tiled, stone, brick and wooden outdoor areas. They use high-end pressure washing machines that work with cleaning solution and hot or cold water. We carry out complete removal of moss, mould, algae and lichens which make outdoor areas slippery and unsightly. Use our affordable jet washing services to keep your external areas properly sanitised. Our staff can apply suitable coatings to make the cleaned areas resistant to dirt, protected from overgrowing and becoming slippery. Moss, algae and lichens will be eradicated and the cleaned surfaces will be sprayed for protection. 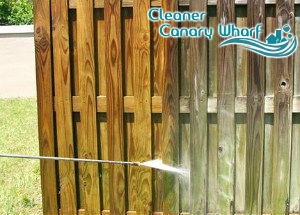 Our jet washing services are implemented in the Canary Wharf region during weekdays and weekends. Fences, deckings, pavements and external walls become darkened, soiled and overgrown if they are not properly and regularly cleaned. You can achieve the desired results if you use the professional jet washing services which we offer in E14 London to holders of residential and commercial estates. Our staff can cover the cleaned walls, tiles, brickwork and slabs with protective and non-slippery sealants. This way moss, weeds, algae and mould won’t grow on them any more.